Tennis elbow – we’ve all heard of it. But do we know what it is? Why is it called that? And why do so many people who don’t play tennis end up with tennis elbow? 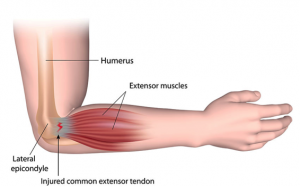 Tennis elbow’s official name is lateral epicondylitis, and it is a tendinitis (tend- meaning tendon, -itis meaning inflammation), so essentially its inflammation of a common tendon which attaches some of the muscles in your forearm to the outside of your elbow (the lateral epicondyle), most often due to overuse. It is characterised by pain and/or burning on the outer part of your elbow, and weakened grip strength. And for those who’ve had it, you’ll know how painful it can be! So why is it called that? Tennis elbow is an overuse injury. Tennis players, who are doing lots of backhand shots and gripping their racquets, are often putting repetitive force and stress through these forearm extensors, and into the tendon where they attach to the lateral epicondyle. Try it – put your hand over the top of your elbow and forearm and mimic the movement of a backhand shot – you’ll feel those muscles working under your hands. What you might find interesting, though, is that tennis elbow is actually more common in non-tennis players. This is because there are heaps of other movements that we do throughout the day which also heavily rely on the use of these forearm extensors (as I’m typing right now I can feel mine working!). They’re also employed in some gripping motions, like trying to hold the kettle while you’re filling it, or cycling and frequently using the handbrake, when you’re painting big strokes with a brush, or when you’re playing Pokemon Go and spending plenty of time in the PokeGym. Why is the elbow susceptible to this? Your elbow is a lovely little joint in between a couple of more complicated joints – the shoulder and the wrist. These joints, as well as the hand, need to work well together to ensure they all take an even load of the forces that you put through your arms and hands all day every day. Just like any system, if one part isn’t working very well, then another may have to pick up the slack. So, for example, if you sit at a desk all day, and your shoulders are tight, stiff, and restricted but you still want to be able to move your arm in its full range? The next joint to try to make up for the missing movement is the elbow. Same goes for your wrist and hand – if you’re doing a lot that requires good movement of the hand and wrist, but for some reason you don’t have good movement of the hand and wrist, guess which joint cops the brunt of those forces? You got it – the elbow. When you have repetitive strain or overuse, the tendons in your elbow can become irritated as they work harder than they should. It is important that when you start to feel these symptoms arise, you actually seek some form of treatment. This is because if tendon irritation and inflammation is allowed to continue without any intervention, it can lead to actual tissue damage, which is often harder to treat. Osteopaths are trained to assess and treat this type of complaint, by assessing how your whole arm and shoulder are working together. Most of all, we try to implement treatment and home-based management that ensures that once this pain has resolved, it won’t be back again. We will also be able to tell you if you need to have any imaging or further treatment from any other allied health practitioners. So the next time you’re doing anything that isn’t tennis and you still feel pain in your elbow, organise an appointment so we can try to address it early on!